Both Martha and Dale feel working with seniors is an honor and a way to pay tribute to their parents. All four of their parents lived into their late eighties and early nineties. Martha and Dale saw firsthand what a difference a smiling face and a few minutes of conversation could mean to their parents. 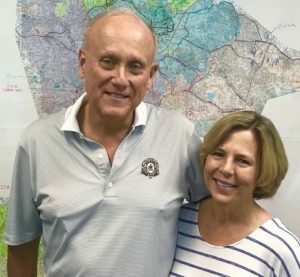 We are so grateful to Martha and Dale for donating their precious time to serve our clients. Our volunteers make up the heart and soul of Senior Services North Fulton. We couldn’t possibly fulfill our mission or serve the number of older adults that we do without the help of our generous volunteers. We welcome volunteers of all ages and will work with you to find a job that matches your schedule, interests and abilities. Consider making a difference in the life of a senior through one of our many volunteer opportunities. Meals on Wheels (MOW) Volunteers are needed for delivery routes Monday through Friday with a minimum commitment of six months of service. Drivers must be over the age of eighteen with a valid Driver’s License. Pre-packaged meals are ready for pickup at one of our four area locations in Alpharetta, Crabapple, Roswell & Sandy Springs. Volunteers deliver meal routes to 5-12 older adults between the hours of 11:00am and 1:00pm. Volunteers are encouraged to sign up for a route at least one day per month but can do more if they desire. Volunteers will have the same seniors each time, so they truly become a friendly and familiar face. Each route takes 1-2 hours…Too busy to commit to a regular route? We also welcome volunteers as substitutes to fill-in on routes as needed. Meals on Wheels for Pets (MOWP) Volunteers deliver pre-measured pet food in plastic airtight containers supplied by the Humane Society and ready for pickup at our corporate office in Alpharetta. Volunteers also pick up from the Humane Society and specialty pet food shops, sort product and deliver pet food routes in Alpharetta, Johns Creek, Milton, Mountain Park, Roswell and Sandy Springs. Routes consist of 4-5 seniors and their pets. Each route takes 2-2 ½ hours and is delivered monthly. We also welcome volunteers, groups and businesses as substitutes to fill-in on routes as needed. Pantry To You Volunteers deliver essential grocery items to home-bound seniors on the 2nd and 4th Wednesdays of each month. This wonderful partnership with North Fulton Community Charities Food Pantry allows us to further serve the needs of our clients who are unable to get to the food pantry. Orders are pre-packed and ready for pick up from the Food Pantry in Alpharetta. Each route includes 2-3 deliveries and takes about 1 hour. While at the client’s home, volunteers visit briefly and take the order for the next delivery. Friendly Visitor Volunteers are paired with older adults in need of companionship. Most volunteers visit once or twice a month for an hour or two, and can be scheduled at your convenience. Friendly visitors occasionally take seniors to doctor appointments, do yard work, help with easy tasks, or simply sit and visit. Friendly Visitors tell us they get back much more than they give. For older adults who do not have family nearby, this is truly a special relationship that makes a dramatic difference in their lives. Occasional Helpers assist seniors on a one-time or short term temporary basis with a special project, grocery shopping, errands, planting, yard work, organizing or small repairs. Accept assignments as they fit your schedule. Senior Center Volunteers are utilized in our Senior Centers located in Crabapple, Milton, Roswell and Sandy Springs. Centers are open Monday through Friday and are a place for older adults to participate in health & wellness programs, social and educational activities and enjoy a nutritious hot lunch. Volunteers can enrich the Senior Center experience by sharing talent, time and life experience. Center staff members welcome office assistance or lunch support as well as help in leading exercise, art and special interest classes such as dance, crafts, card games, guitar/music, etc….consider becoming a Senior Center Volunteer! Office and Staff Support Volunteers assist the ever increasing work of Senior Services North Fulton. We welcome office work and phone assistance volunteers, special event committee members and others to support our staff toward fulfilling our mission. Like doing website design, writing articles for the paper or updating database information? We’d love to have you! Group or Corporate Volunteers may host a day of service for a senior, or at one of our senior centers, sponsor a special needs drive, assist with our Angel Tree Holiday gift program, annual fundraiser or other special events. Angel Tree Giving Program Volunteers help fulfill older adults’ wishes at the holidays. The holidays can be a lonely time for many of our seniors, especially those who live alone. The Angel Tree Giving program helps lift their spirits. Seniors submit a wish list, which organizations, students, and volunteers can fulfill.